Vegan? Me? Me eat vegan? Well, I'm not opposed to it, but I am most certainly an omnivore nisi glutine (eat everything except gluten). I don't find myself eating vegan very often. There are some meats I like very much. There are some meats I won't touch. I eat a fair bit of dairy and I like it. I was raised on a small farm, for crying out loud. I've always assumed that I would never become vegan. I'm not particularly interested in trying meat substitutes. I'm perfectly fine eating real crab and real chicken. I don't want the vegan substitutes. The vegan substitutes of these hold no allure for me. But eat vegan once in awhile? Especially when the vegan restaurant provides gluten-free options for many of their standard menu items, all of which are vegan and organic. I'm all for good food... even if sometimes it is vegan. Great Sage is a vegan restaurant that is pretty unassuming. Not pretentious. Not granola, either. It is located in a nice, small, strip mall in Clarksville, MD. It's decor is cozy, not fussy and not frumpy. All that is just the first impression. Then you get the menu. Carnivore? They have substitutions for that. No separate menu for each of these special categories. Everything is easily managed on one menu. Options are clearly labeled for each item. And this menu is full of gluten-free options. There was no need to resort to having a gluten-free salad. But I like salads and my body needs salads. I eat a lot of salads and sometimes they get a bit routine and boring. But I saw this one that looked different. It looked like it was worth a try. I must have been hungry. And it must have been good! 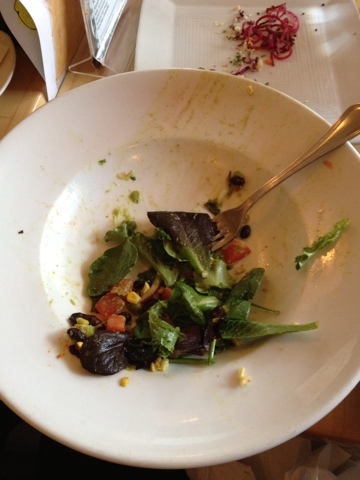 This is what was left of my Santa Fe Salad, gluten-free, by the time I remembered to take a picture. It included black beans, roasted corn, red onion, tomatoes, guacamole, and some roasted tofu. All this was lighted covered with a lime-cilantro dressing. It was fabulous! I don't remember even seeing the tofu, let alone noticing it. I don't usually worry about ordering a gluten-free bread substitute or starch with my salads. I don't normally need it. But I saw the gluten-free cornbread on the menu and wanted to try it. Of course, I had to compare it to my own gluten-free cornbread. It was good and held together nicely, without seeming gummy. It was rather short and a bit drier than I like, but it certainly stayed together when I bit into it. Mine only does that when I add xanthan gum and guar gum. Of course, this version may have also had the gums in it too. I don't know. But look at that fabulous, golden brown top! Perfect. 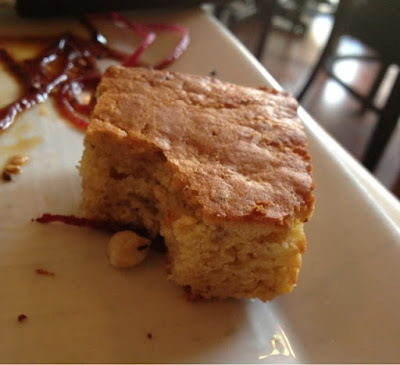 Overall, this gluten-free cornbread was very good. I was very happy that they offered it on the menu. A rarity. For my "main" course, I did a 360 and ordered the "starter" Vietnamese Spring Rolls, with the gluten-free option. Again, I forgot to take a picture before I dove in. 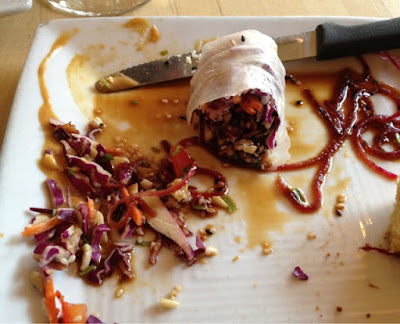 These spring rolls were served with a fabulous peanut sauce. This is usually where these kinds of dishes fail to be safe for me. Peanut sauce is usually made with soy sauce that is not gluten-free. This is such a bummer. I love gluten-free peanut sauce and this one was great! It finished these spring rolls off perfectly. Everything I ordered was vegan. Everything I ordered was presented beautifully. Everything I ordered was delicious. 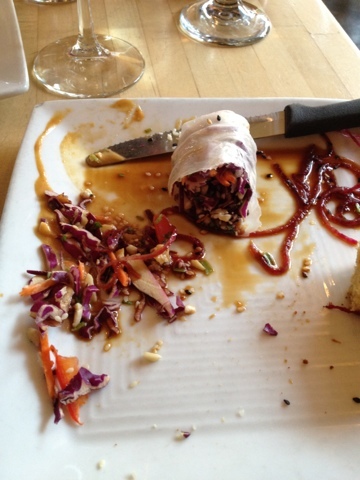 If you are in the area, Great Sage can take care of your gluten-free needs and deliciously so! I enjoy Great Sage a lot, and I appreciate their menu options. So tasty!